It's been known for years that adding calcium (Ca) to YBCO can increase its current-carrying capability across grain boundaries (GB) by as much as 35% . And it seems to shield from "the effects of magnetic fields on transportation properties" . Unfortunately adding Ca to YBCO also typically depresses the critical superconducting temperature. This problem was tackled in November 2006 when Superconductors.ORG announced the discovery of the first calcium-doped YBCO variant with critical transition temperature higher than pristine YBCO. That compound, (Y2Ca)Ba4Cu7O16+ , produced a Tc near 96K (see plot above right). The newest YBCO variant, Y3CaBa4Cu8O18+ , has an even higher transition temperature due to a larger unit cell with 16 layers. 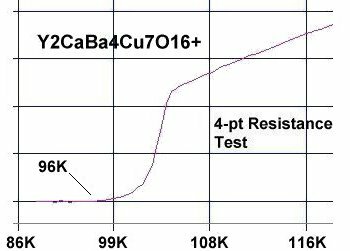 The Ca-doping level has also been reduced from 33% to 25% by the addition of another YCuO2 layer. The "jitter" just to the right of Tc in the plot at page top is likely a result of minority phases. However, the two additional phases most likely to result both have Tc's near 96K. 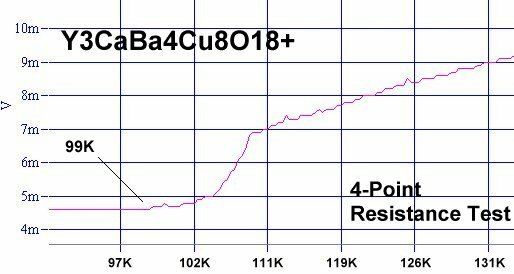 Y3Ba4Cu7O16 and (Y2Ca)Ba4Cu7O16 both have the 1223C/1212C structure (shown above). This insures that the volume fraction is high for superconducting phases above 96K. The value of this discovery lies in giving YBCO manufacturers a means of maximizing trans-GB current transport properties while simultaneously facilitating a Tc increase. Synthesis was by the solid state reaction method. Stoichiometric amounts of the below precursors were mixed and pressed at 70,000 psi, then calcined for one hour at 775C, then sintered for another 11 hours at 890C. Lastly, the pellet was annealed for 10 hours at 500C in flowing O2.